Vietnam’s capital, Hanoi, is regarded as one of Asia’s loveliest cities, with scenic parks and lakes, tree-lined boulevards and history-drenched architecture. Despite increasing development, this ancient city still retains a unique identity and cultural traditions. Take a city tour discovering Hanoi’s hidden parts on vintage Russian Minsk motorbikes, guided by a professional rider. En-route, glimpse magnificent architectural legacies of the French-Colonial era, including the iconic Opera House, built in 1911. Drive along narrow backstreets, stopping at Vietnam’s biggest second-hand mechanics and electronics market. Later, drop-in at a Hanoian family apartment, home to a Vietnam war veteran, with a rare opportunity for cultural exchange over tea. Later, sample Hanoi’s world-acclaimed street food. Beyond Hanoi’s metropolis, head out to the Red River Delta and Hung Yen Province for Nom, a two-centuries-old village that has remained relatively unchanged over the ages. During our time in this quaint village, explore the local market and lakeside pagoda. As we cycle along the red brick streets shaded by mature Banyan trees, our guide will point out typical features of northern Vietnamese villages. Nom’s distinctive ancient architectural runs to a finely carved arched gate, village well and an uncommon stone bridge. Drop-in at a traditional ancient house to meet a local family, where we learn more about Nom Village culture and its age-old traditions. A three-hour drive out of Hanoi brings us to Mai Chau, located in Hoa Binh Province. Mai Chau is known for its stunning backdrop of mountains and idyllic valleys filled with picturesque rice paddies. The rustic villages and traditional wooden stilt houses that constitute Mai Chau are inhabited mainly by the White Thai ethnic group. At the heart of Mai Chau, trek around Kha Lake, en-route passing several White Thai villages, which emanate a timeless quality. During the day, most of the White Thai residents are invariably away from home engaged in rural activities. During our trek, we get a rare opportunity to engage with the locals. Later, at a forest village, we meet an ethnic Thai family, where we can see first-hand local minority culture and traditions. We make the five-hour drive to remote Son La Province, bordering Laos to the south. This breathtaking, rugged mountainous region is one of Vietnam’s most ethnically diverse, home to more than 30 different minority groups. Make a stop at Moc Chau, well-known for its highland tea plantations, where we have an opportunity to trek down to hill-tribe villages. Later, we arrive at the same-name provincial capital of Son La. This sleepy town was once the site of a sizeable French garrison during the French Indochina war. Due to the area’s harsh climate and remoteness, the French also established a prison here. Nowadays, Son La is expanding rapidly as Vietnam aims to bolster the population in this northernmost region. In the morning, visit the old prison, now in ruins but housing the Son La Prison Museum. Dedicated to celebrating the achievements of its former prisoners, this small museum is a poignant reminder of former French colonial rule. Afterwards, embark on four-hour drive to Dien Bien Phu, along winding, steep roads cutting through stupendous scenery of terraced rice fields and forested mountains. Stop at Pha Din Pass and a Blue H’mong hill-tribe village, before arriving at provincial capital, Dien Bien Phu, formerly one of Vietnam’s largest opium-producing regions. Dien Bien Phu is however better known for its namesake decisive battle and defeat of the French by the Viet Minh in 1954, during the First Indochina War. Early evening, drive to Men Hamlet to engage with the Thai ethnic minority people. Make the overland border crossing at Tay Trang into Sop Hun and northern Laos, transferring over to Muang Khua. After a 90-minute drive south, we reach Muang La, a picturesque rural town beside Nam Pak River. The following day, set off early morning by four-wheel drive, heading deep into remote rural countryside. Our drive reveals wondrous river views, rice terraces and small riverside villages. 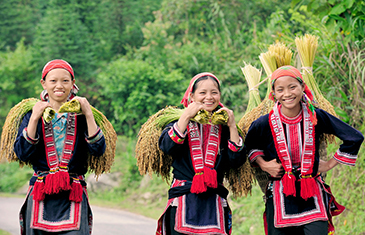 Trek along lush mountain trails, en-route encountering local farmers toiling in rice fields. Here, learn how locals cultivate their lands, hunt for game and fish in mountain streams. 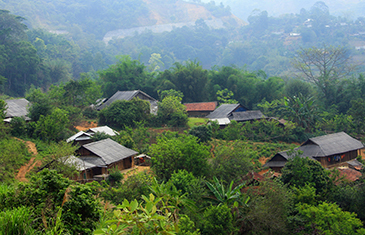 Trek deep into rainforest, arriving in Ban Phavie, an isolated Khamu village set atop a hill. Post-lunch, head to nearby waterfalls to relax in the refreshing cool water. After breakfast, transfer from Muang La to Nong Khiaw and check in at your beautiful riverside resort. In the afternoon, explore the area around Muang Ngoi including caves and villages on a half-day trek. Walk 30mins to visit Tham Kaang, a massive cave which acted as a natural bomb shelter for the locals during the Indochina War in the 60s and 70s. Spend some time appreciating its natural beauty before continuing to Ban Houay Boor, a village inhabited by the Khmu and Tai Daeng ethnic minorities. Notice how most of the agricultural work is done communally, including the planting of rice, corn, bananas, and sugar cane. Continue to the Tai Daeng village of Ban Na. The Tai Daeng (Red Tai) originated centuries ago from around China’s Red River. Notice how the Red Tai men and women have almost equal division of labour, both ploughing, cooking, tending to children and cleaning house. Later, return to the resort. Following a route along the Nam Ou River, merging into the Mekong River, enjoy stunning verdant mountain and paddy field landscapes. Stop in Ban Nambak, strolling through the village and local market. Later, we arrive in magical Luang Prabang, an ancient royal capital and UNESCO World Heritage town, considered the heart of Laotian culture. To learn more about Laos’ fascinating history and culture, head to Ock Pop Tok Living Crafts Centre, a well-respected textile gallery and weaving centre, set alongside the Mekong River. Enjoy an exclusive talk with a long-term Laos resident and UNESCO consultant on Heritage Preservation Projects. He will share with us his expert knowledge on Laotian history and cultural heritage. At dawn, participate in centuries-old ‘Tak Bat’, Buddhist morning ritual, offering alms to a procession of hundreds of saffron-robed monks. 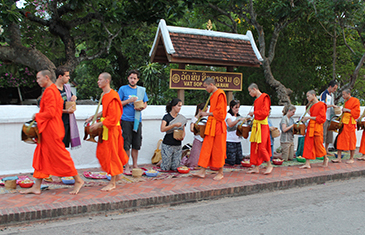 Then embark on a half-day guided walking tour exploring some of Luang Prabang’s highlights. Visit the Royal Palace, now a National Museum, housing precious regal artefacts. Amongst many of Luang Prabang’s ancient gilded temples (wats), explore Wat That Luang, traditionally the royal cremation site. Our tour concludes with a climb to the summit of Mount Phousi, revealing panoramic views. 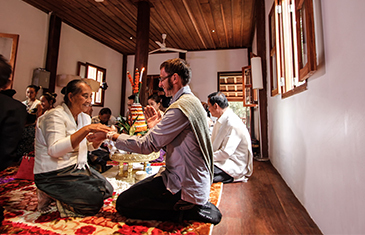 Based on ancient beliefs and practices, Baci blessing ceremonies are an integral part of Lao culture, marking significant events like marriages, deaths, or coming of age. We participate in this authentic and enlightening ceremony at a local family home. Spend a morning exploring the area around one of Luang Prabang’s most picturesque attractions, Kuang Si Waterfall. Hike through jungle parklands to Kuang Si Bear Rescue Centre, located nearby. Established in 2003, the centre has rescued numerous bears from wildlife traffickers and traditional medicine traders. A private guided tour shows us what can be done to protect one of Laos’ most endangered species. We also help-out with the bears’ midday scatter feed. Afterwards, stroll to Kuang Si Waterfall, where cascading tiers plummet down into azure pools. Heading upstream by boat from Luang Prabang, visit the remote temple shrine of Wat Done Khoun Nelemith, set on a Mekong River islet. Continue to Pak Ou Caves, sacred cave-temples crammed with 4,000-plus Buddhist statues.